Hello dearest friends. I have a few super exciting announcements. The first is that the extra special holiday project I’ve been working on is finally ready to be introduced to the world. This is something I have wanted to share with you for a long time now and I’d like for you to formally meet The Curated Cookie Platter. 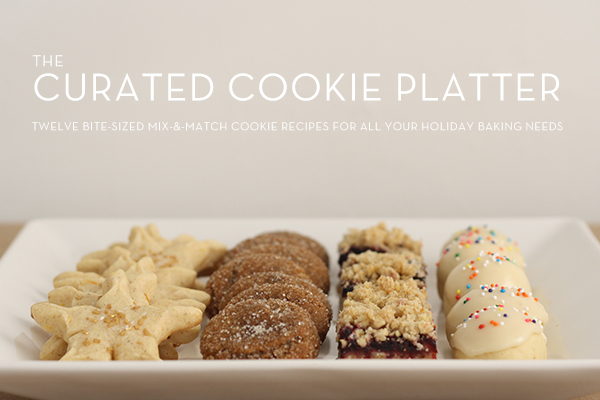 The Curated Cookie Platter is a collection of twelve bite-sized mix-&-match cookie recipes for all your holiday baking needs. There is something for everyone. There is probably too much booze and spice but it is December and therefore I am allowed a bonus amount of adjectives. Curious what is inside? 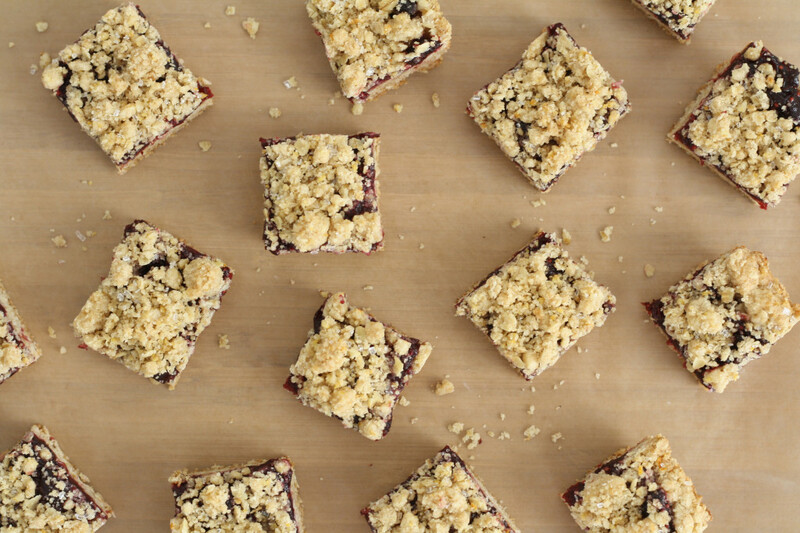 Well to start, there is this recipe for Mulled Red Wine Cranberry Crumble Squares. Selecting just one recipe to share was like having 12 children; it was difficult to choose my favorite. But mulling red wine, adding tart cranberries, and sandwiching it between two layers of orange-spiced oat crumble tugged at my heart strings just enough for me to share it with you in the preview. 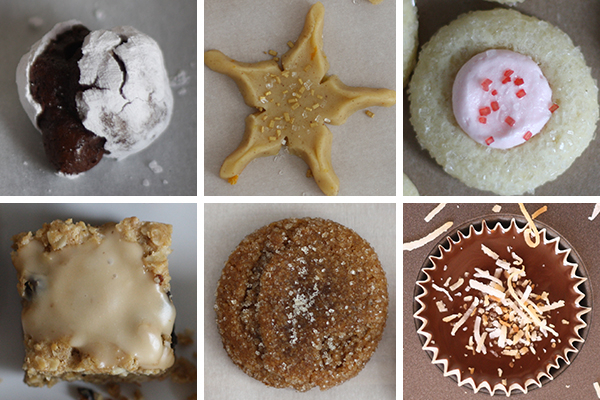 But TCCP (or how it has lovingly become known in my email) also includes a few of your new favorite cookies. Perhaps you want to meet the glazed and sprinkled soft Fernet Branca cookie, or fudgy peppermint crackles (which happen to also be naturally gluten-free) or a few dozen spiced fresh ginger and orange snowflakes (for which all you need in the special equipment department is a star cookie cutter and a few pinches)! All the recipes are scaled to make relatively small batches and are meant to be mixed and matched and introduced to each other on your fanciest plate. Pick one or two or four recipes that inspire you, invest in an afternoon of baking, and curate your own cookie platter. And the second super exciting announcement is that I will be on The TODAY Show this Wednesday, December 18! Yes! OMG! ZOMG! For what I am sure will be a super fast 0.5 seconds for you but an extremely long 0.5 seconds for me – I’ll be there and will be sharing a super special holiday cookie recipe. I’m real excited and will try to capture a behind-the-scenes picture or two of the adventure. P.S. Speaking of, do you follow BMUB on Twitter yet? I hope you enjoy the recipes I’ve put together and that The Curated Cookie Platter inspires you to get your holiday bake on! Make the crumble: Zest about half the orange into the bottom of a medium bowl. Use a vegetable peeler to create a few wide strips with the remaining peel and place them in a medium saucepan since you will be using them shortly for the filling. Whisk the flour, oats, sugars, baking powder, salt and cinnamon into the zest. Add the butter and use your fingers to work the butter in until coarse crumbs form and the mixture holds together when pressed. If it is a tad on the dry side, mix in a teaspoon or two of warm water until it holds together. Refrigerate the mixture while you make the filling. Make the filling: Combine all ingredients (except for the sugar and salt) in a medium saucepan (your orange peel should already be hanging out in there!) and set the pan over medium heat. Cover and simmer for 10 minutes, stirring occasionally. Remove cover and turn up the heat slightly. Cook for about 5-10 minutes more until the cranberries begin to burst and the sauce has thickened. Turn off the heat and discard the orange peels. Taste the filling – if the cranberries were on the extra tart side then stir in the tablespoon of sugar and a pinch of salt. Let the filling stand for 20 minutes at room temperature, or if you are in a rush, refrigerate for 10-15 minutes. You just don’t want to put hot filling on top of the crumble. Assemble and bake: Preheat the oven to 350. Butter an 8×8 pan and line with two overlapping pieces of parchment. Press about 2/3 of the crumble into the bottom and up the sides of the pan, using the bottom of a measuring cup to really pack in the crumble in tight. Spread the filling in an even layer over the base and crumble the remaining 1/3 of the oat mixture over the top. Bake for 25-30 minutes or until the top of the crumble is lightly brown and the filling is bubbling. Let cool completely, remove from the pan, and slice into small squares. The mulled red wine bars are only the beginning – eleven more recipes are included in this extra special holiday bonus cookie extravaganza for just $1.99. I would like the PDF download to my computer! Please click on the button below, then after the payment screen, click on the link “return to buttermeupbrooklyn@gmail.com” and the book will download from DropBox to your computer! I would like the iPad download. Please click here! Any questions? Having a download problem? Please email me at lillie@buttermeupbrooklyn.com and I will try to get back to you as soon as possible! Happy holiday baking! Your all cookies are just superb !!!!!!! Those look DELI SH! I’m reading this over my lunch hour, so I’m drooling over those cookies! I’m definitely going to save that recipe and try it out, but probably not until after the holidays because I’m so dang busy! The platter looks beautiful! I was thinking of doing something similar for our Christmas celebration and this gave me great ideas! And mulled wine bars? I’m a huge mulled wine fan, these look perfect! Love these! Thank you! Good luck tomorrow!! Sign me up! I’ll take streusel over frosting any day. Congratulations on this sweet little project and good luck tomorrow! That is major. Look delicious! 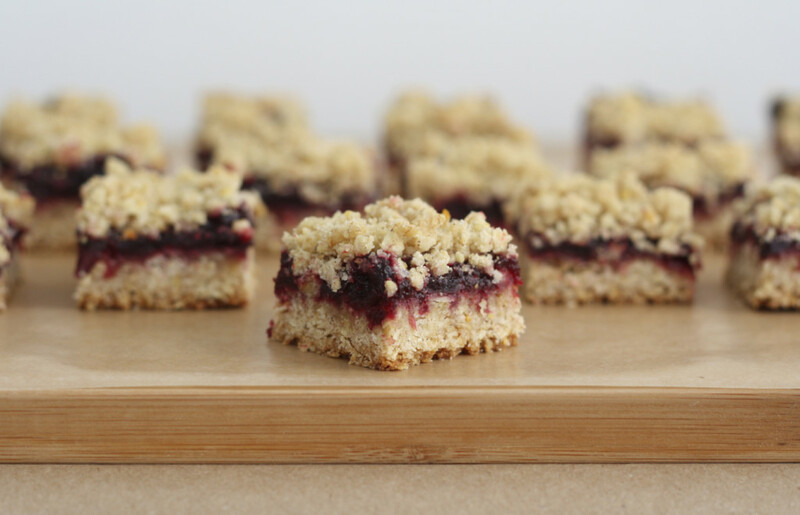 Especially the Mulled Red Wine Cranberry Crumble Squares. It’s very nice to find so special and tasty recipes.